Categories: New!, House collars - 'everyday' range. Our house collars are 1″ (25 mm) wide and available in one size which which is easily adjustable for necks 12″-17″ (30-43 cm) in circumference. A strong webbing base, hard-wearing fabric ribbon and military quality buckles and side release clips ensure that the collars are both safe and durable. 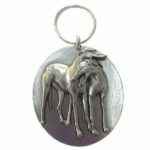 A D ring is included so you can attach an identity tag (see our Red Dingo range of dog tags). Please note that these collars are not intended to be used with a lead for sighthounds; it is recommended they are used as a house collar or tag collar. Sighthounds should use a walking collar (martingale or fishtail leather collar) for lead attachment.